Here’s something neat. 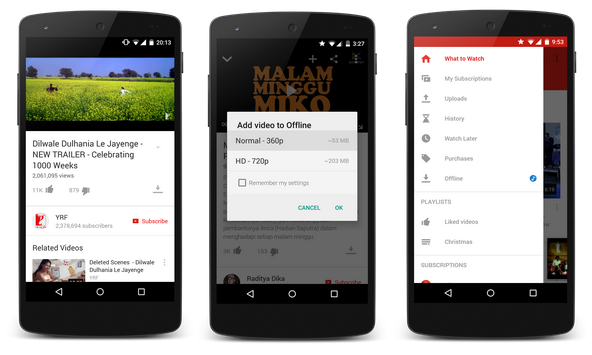 Google has introduced offline video playback for YouTube mobile users. That’s an exciting feature but there’s bad news for most TechCrunch readers: it’s only available on Android devices in India, Indonesia or the Philippines at this point. The company said the update will allow “much of [the] popular YouTube content” in these places to be watched without an internet connection. Videos that support playback will include an offline icon which, once tapped, offers a choice of playback quality. Once cached, each one is available to watch without internet access for up to 48 hours. Google has specifically picked these three markets because of the importance of mobile internet, coupled with the lack of people with data packages — not to mention the sometimes frustratingly poor quality of internet too. “Asia has proven itself to be a mobile-first world in terms of smartphone adoption, but access to high-speed, affordable data remains a big challenge. In response, we’ve been working on ways to lessen the demands of speed and data for people using our products in places where there are challenges to access,” the company said in a blog post. Google, which launched the Chromecast in India this week, said that it will continue to look into “better ways to make video content more affordable and accessible” to users based in Asia. YouTube Offline was actually first revealed back in September in India, in conjunction with the Android One launch. Doubtless there are many other YouTube addicts the world over hoping that the feature will land on their phone soon — unfortunately Google is not giving a time for when that might happen. Earlier today, the YouTube Android app did get an update for all users to enjoy — it received a ‘material design’ makeover and got new search filters. That’s not quite as cool as offline video playback, right? !